As I get older, I need more light to see well...so we are replacing our field lights! Seriously, it's for our players. We had some shadowy spots. 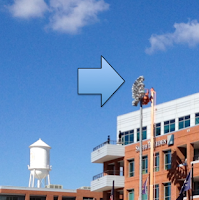 For the 2014 season, the DBAP field will be brighter and evenly lit. D3 Development is managing all of this work. D3's Shannon Moser tells me the lights are guaranteed for 10,000 hours or 10 years which means less maintenance over time. And with Musco's green lighting system the energy usage will be lower. Fewer bulbs, less power, more lumens. That's a big improvement since the original lights were installed in 1995. Baseball endures and technology improves.